February is theme month once again for Revolution Rock! For more information, visit the always intriguing and informative, Revrock.blogspot.ca. Click to learn more and listen to the first and second part of the series. Grant Green is often viewed as an unsung hero of Jazz guitar and was very underrated during his lifetime. 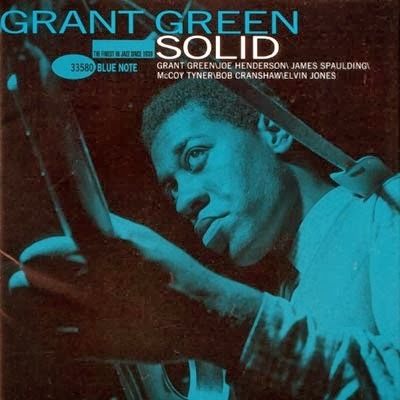 Green has been on a multitude of recordings both as a sideman and solo artist, which were primarily released through the Blue Note label. Solid was one of two albums recorded in 1964 (the other album being Matador), yet they remained unreleased during Green’s lifetime. The musicians on Solid were pianist McCoy Tyner and drummer Elvin Jones, both of which made up two thirds of John Coltrane’s rhythm section. Some felt that this album contains some of his Green’s finest work, but it remained unreleased for fifteen years before getting a proper release in 1979. This episode of Revolution Rock will feature a selection of tracks from this album, as well as a mixture of other genres in celebration of Black History Month. Check out this episode on Tuesday February 18th, 2014 from 10:30AM to noon. This entry was posted in news and tagged black history month, Grant Green, Revolution Rock, Specials. Bookmark the permalink.